The 1990s was the decade that gave us supermodel Kate Moss and grunge style. It was a mashup of styles that lead us into the 21st century, whether we were ready or not. 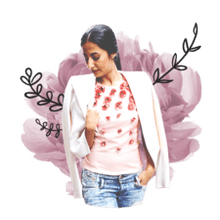 Whether you lived through the decade and want to relive the styles of the times, or you're looking to try some of the 1990s trends, you're in luck. Several style trends from the 1990s are back and more popular than ever. Take a look at some of the most stylish trends that you can wear today! Thanks to the Seattle grunge trend of the 1990s, flannel shirts were a go-to for many young, stylish people. It was common to wear them oversized or baggy, or wrapped around the waist of your overalls and boots. The hit TV show, My So Called Life brought the grunge look and casual west coast style into the closets of teens everywhere. There are plenty of options for the classic flannel, including a more tailored look. Or try a top that mixes the '90s and today. 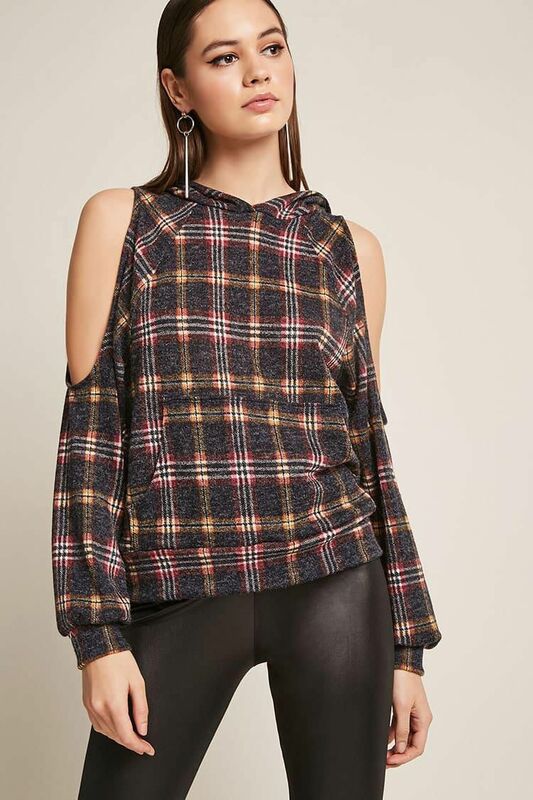 The flannel trend today gets an update with the modern cold shoulder trend in this Plaid Open Shoulder Top from Forever 21. The crop top wasn't started in the 1990s. In fact, it was popular in the 1950's and 60's, and even into the '70s and '80s in certain circles. What makes it so popular in the '90s was the star power behind it. Celebrities like Gwen Stefani, Britney Spears, and the Spice Girls wore them on stage and on the red carpet. Today it's made its way back into athletic and cute everyday styles, as well as sweaters and special occasion outfits. You can easily find a style that suits you. Try a bit of a glam '90s look with this off the shoulder Bardot Fill Jersey Crop Top from Pretty Little Thing, or the Smocked Crop Top from Free People you see here. The slip dress was THE dress to wear in the 1990s. With thin little straps and an unstructured shape, it was simple, sophisticated, and a little bit naughty. The nighttime appeal made some slip dresses impossible to determine from a nightgown or actual slip. The most popular materials for this silhouette was satin or silk. And while the slip dress was popular in many lengths, the mini or midi length ruled red carpet events. To relive the glory days of the 1990s, mix it with today's fashion trends. The Brandy Satin Wrap Dress from Revolve includes a satin chocker, and the light pastel pink that was so 1990s. Both are making their mark again today. Combat boots are not just for the military. This popular footwear trend of the '90s has made a great comeback thanks to pop stars of today. Want to try this trend yourself? You can always go with a pair of Doc Marten boots, like this pair found at ModCloth. This brand is well known for their sturdy boots with raw attitude. If you want something more sophisticated, or with softer look, there are plenty of options out there. Try a pair like this Vince Camuto Tailorini from 6pm which also combines the 1990s goth, velvet, and combat boot trends in one! Pair these boots with a mini skirt and crop top for true Empire Records and 1990s style. Or wear them with a pair of leggings and a long tunic or flannel shirt. They're so easy to wear with any outfit! Chokers were a popular necklace style in the 1990s that have made a recent comeback. Because they are easy to wear with any open neck silhouette, you can wear one just about anywhere. This Valentina Black Lace Choker from Tobi is a great way to throw it back, or you can try a different approach. The more modern approach is to wear a thin metal chocker with several slightly longer necklaces layered below it. Or, try one made out of a soft fabric that ties up the front. And if you really want to '90s it up, go for a simple velvet ribbon style choker necklace. The mini backpack is part purse, part backpack, and super cute. This trend ruled in the 1990s along with several other "cute" trends like butterfly clips, pixie cuts, and babydoll dresses. While other cutesy trends have had less of a comeback, the mini backpack is back in full effect. High end fashion houses as well as fast fashion shops are stocking mini backpack style purses in fun colors, furry materials, and even metallics. To try this trend without breaking the bank or going over the top, pick this one from Top Shop, available at Nordstrom. It's keeps your hands free so you can stylishly go out for the night, go to a concert, or ride a bike. Overalls were a casual cool style must have in the 1990s. It was especially cool to leave one shoulder undone, letting the strap and bib dangle on purpose. And light denim, velvet, or corduroy were the top materials of choice back then. It was a style that borrowed from the farming community and instantly made cool by hip hop and chic models. In current fashion trends, you can still find the casual denim overalls with ripped knees at popular shops, this pair from Urban Outfitters. And overalls have gotten a more sophisticated boost thanks to tailored silhouettes, crisp materials, and bold colors. For a modern day denim style, try this Wet Seal Distressed Overall. To kick yours up a notch, try wearing a tailored pair over a silky blouse or lace top. And don't forget that the overalls trend extends to the mini dress. For extra 1990s flair, wear this cute style over a turtleneck and pair with white knee high socks and combat boots. And if someone tells you it's out of style, tell them "as if!". Ripped denim is everywhere right now! But it was first popular in the 1990s when the grunge trend was in full force. While it was part of the culture to wear torn up clothing then, it's taken on a slightly different tone now. The rips range from small and slight on chic skinny jeans, to vast and nearly covering the entire pair of jeans! You get to decide what style suits you best. If you want a real '90s feel, let the loose threads hang and the hole fray naturally. For a more current look, keep the rips more precise and the threads from getting too messy. This white pair of Harper Knee Slit Jeans from Francesca's is a great way to combine the light denim and ripped denim trends from the 1990s with an updated design. Plaid isn't just for the flannel grunge trend from the 1990s. There was a preppy plaid that was popular in the school hallways and offices alike. In fact, plaid was huge in mini skirts, crop tops, stockings, oversized sweaters, and stirrup pants. Wearing plaid in a bold color, like Cher did with her yellow plaid mini skirt in Clueless, is so 1990s. Try this plaid crop top from Tobi with the matching skirt, a pair of high waist jeans, or even over a turtleneck or blouse. Hoops earrings and the thin eyebrow trend of the '90s are optional, but highly encouraged.